Today is Star Wars day! And Beer Club! 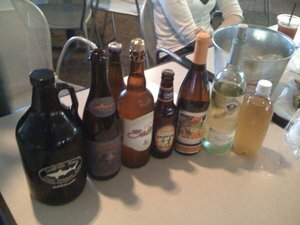 Due to schedules and various other factors, this month's beer club was a rather small gathering, but there were still some great beers to be had, as well as some wine and even homemade hard cider. And that just about covers it for the beer. I had a couple of the wines (including a Chaddsford Spiced Apple Wine that sounded and smelled great, but the taste was quite off for me - would have wanted some sort of carbonation there) and the hard cider, but none of those really stood out as much as the beers. Despite the small session, good times were had by all that managed to attend, and I'd count it as yet another success. As usual, I'm already looking forward to the next meeting! It's been a little tough...he came so early, he's been having trouble eating, but it seems like he's starting to turn a corner. Still not getting much sleep, since he's up every few hours to eat, but that's true of most if not all newborns. I'm catching up on my blog reading, but still pretty far behind...less time to read these days! I'm happy to see your latest adventure in homebrewing went well! This page contains a single entry by Mark published on May 4, 2011 9:03 PM. Double Feature: Royal IPAs was the previous entry in this blog. Russian River Redemption is the next entry in this blog.